Something of a black comedy with a slow start, but potential to grow into a decent story. Honestly, I’m getting flashbacks of My Shy Boss right now–at least the feelings I had while watching it. That is to say, I don’t love the main girl, and I despair at the lack of chemistry between…well anyone. This story starts off with a despondent female lead, Eun Ho Won, who is both frustrated at the literal years she has gone without a real job, and a lack of mental efficiency to change her circumstances. 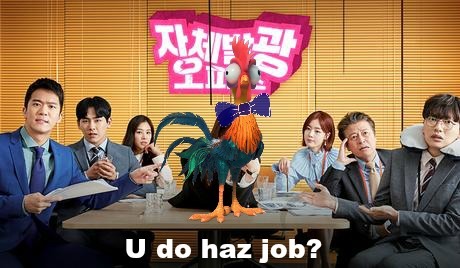 Did the writers intend for Eun Ho Won to look like HeiHei the chicken wearing a tie and applying for a job at a competitive company intern program? I’m not sure. But it sure seemed that way. Not only is she awful at interviewing, largely unqualified despite her insistence that she really really can do a good job, and rather prone to giving people the stink eye, she also gives up at the least resistance in her path. Her character says she’s patient and able to endure. She mutters it to herself constantly. But we don’t see a lot of that in the first three episodes. Or any of it? On top of sucking at life (doesn’t this show sound uplifting? ), she finds out that she might have a terminal illness after she unsuccessfully tried to kill herself. I’m not putting a spoiler alert there because it’s in the premise of the show, and all the trailers, so I figure you know that going into this. This plot point is the one that annoys me the most. It is SO PAINFULLY OBVIOUS that a simple visit to the doctor would clear up her uncertainty about how long she has to live, or whether she’s even truly sick. But is that sort of logic found here? Of course not! They use all kinds of excuses to keep Eun Ho Won from going to a doctor. She’s too poor, or she doesn’t want to know, or she prefers living her life like she’s dying. It’s super fun! And I’m sure that the writers have something in mind here, but the choppy excuses to keep Eun Ho Won from the doctor isn’t suspenseful. It’s dumb. And it doesn’t make sense. Or does it? We are talking about HeiHei the intern, here. Darwinism at work. I will say, that as exasperated as I was for the first three episodes, just hanging in there and waiting for Eun Ho Won to make good on her many promises that despite what it looks like (over and over and over and over and) she is a capable human being worthy of someone’s respect, they did finally give us a glimpse of her fabled work ethic. 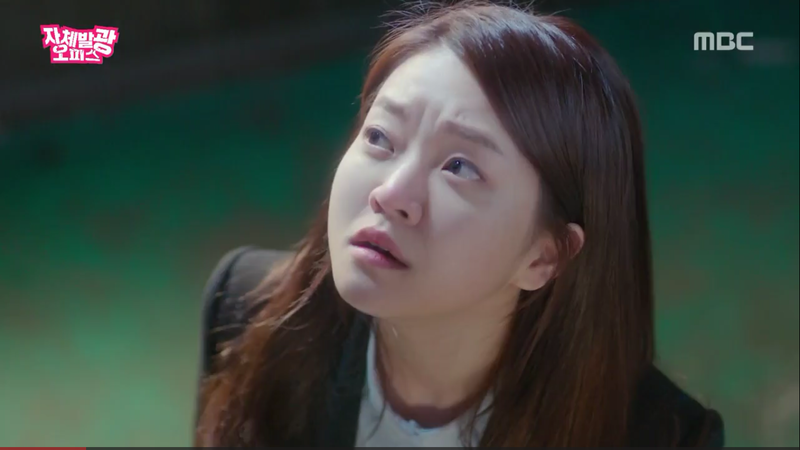 Episode four showed Eun Ho Won pulling herself up by her bootstraps and fighting for her job. And if you’re wondering why I haven’t mentioned any male leads or romantic interests, that’s because there are none. I mean he’s there. His name is Seo Woo Jin, and he has all the personality of a generic Birthday card with a Visa giftcard inside. He’s her boss, and so far, he has done nothing but…well…be her boss. There’s not even anything simmering or bubbling beneath the surface here. There was one small romantic interaction with the second lead, who is a doctor. Who offered Eun Ho Won a free physical. Which she turned down. Because she’s a chicken brain. But other than that, I guess I will have to wait for this aforementioned “romantic interest” that may or may not develop. As far as the office drama plot goes, it’s really not too bad. I like the company, and so far, the little challenges they have faced have been enough to keep me interested. With the glimmer of hope given to us in episode four, I’m willing to hang in there to see Eun Ho Won grow a backbone that hopefully extends up to her prefrontal cortex so she can start making rational decisions that don’t make me want to poke attack her through my computer screen. 1.) Eun Ho Won is also maybe schizophrenic? Wtheck is with those weird visions she keeps seeing? 2.) Does everyone in Korea live in rooftop apartments? What do they do with all those rooms underneath? And that’s pretty much it for my first impressions! I’m glad I waited until watching all four episodes before reviewing it, because believe it or not, this whole rant would have been at least 12x more scathing. I ended up dropping My Shy Boss, so I’m really hoping Radiant Office picks up and adds some spice to their characters. I am only watching this one cuz I like some of the actors. The two other contractors are from the reply series. And the boss is from one percent. But the story is a bit sad. Idk how long I will stick with it. That’s why I’m watching it, too. But my 1% guy is hardly in it so far. And yeah, it’s pretty depressing! I only watched the first ep only because of the male lead but I don’t think I can continue…there’s better dramas out there.